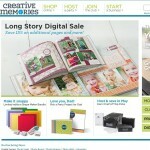 “Creative Memories” by Rhonda Anderson and Cheryl Lightle, found at creativememories.com, is a multi-level marketing/ MLM company that deals in selling scrapbooking supplies and recruiting people to distribute and recruit others. While it’s true that we don’t recommend getting involved in MLM to anyone, the case is not any different with “Creative Memories”. We still don’t recommend MLM due to the high failure rate of success. The company does have a solid enough line of products, however, they filed for bankruptcy last year and have let go quite a number of employees. This may or may not affect how a sales consultant may get paid in the future, but bankruptcy is never a very reassuring issue for engaging in business with those filing. Creative Memories has had its share of employee and distributor grievances, yet those who use the product seem satisfied with results. To join as a salesperson, it costs about two hundred dollars for the Creative Memories kit, training, access to their website back office and sales and marketing tools. Sales commissions are 30% on personal sales plus bonuses at certain levels. The basic scrapbooking software costs around seventy dollars to the consumer, and the scrapbooks and supplies have different prices. Since there are more honest comments from users of Creative Memories products, and very few fake shill reviews, you can see there are many happy customers. As to the mlm recruitment, it all depends on your ability to create a successful downline, that itself is a difficult enough challenge. Scrapbooking companies like ‘Creative Memories’ usually cater to women, so there is that issue to contend with – a limited demographic. You will have more success with direct selling than dealing with multi-level marketing where this business is concerned. It’s a good product but we don’t recommend getting involved with “Creative Memories” as an MLM member or affiliate.